Ancient Egyptian "Ushabti (1075-715 B.C.E.)" The above listed item is from the the Third Intermediate Period(1075-715 B.C.E.). This "servant of the afterlife", eyes painted black. It has most of its blue faience glaze, it's intact except for a slight chip at the base and has age wear. The reason for the item being available is due to the vast extent of old archeological findings, thousands of years in Egyptian burials and also the proliferation of these said items in private collections worldwide. Ushabtis are one of the most popular Egyptian collectibles, they are a good investment, long lasting and a true example of the Egyptian funerary culture. Our company spends a great deal of time researching and investing monies on private acquisitions to make these items available to you, at a low auction price. We stand by our unconditional, full money back guarantee. The timeline on our items is a suggestive guideline for the listed Egyptian Period. 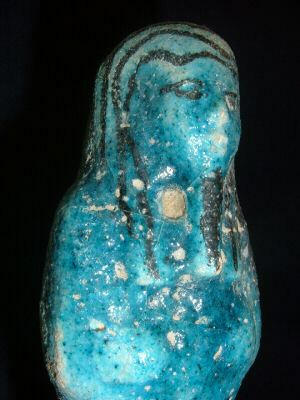 Rare Ancient Egyptian "Blue Faience Ushabti"
The above listed item is from the the Third Intermediate Period(1075-715 B.C.E.). This "servant of the afterlife", eyes painted black. 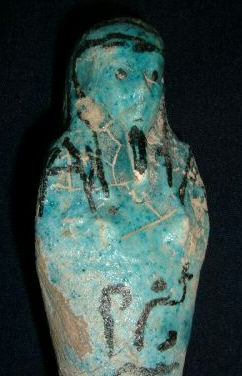 It has most of its blue faience glaze, it's intact except for a slight chip at the base and has age wear. The reason for the item being available is due to the vast extent of old archeological findings, thousands of years in Egyptian burials and also the proliferation of these said items in private collections worldwide. Ushabtis are one of the most popular Egyptian collectibles, they are a good investment, long lasting and a true example of the Egyptian funerary culture.The timeline on our items is a suggestive guideline for the listed Egyptian Period.